This post includes affiliate links. This adds no added cost to you but helps fund our blog. We participate in our local CSA (community supported agriculture) and received, among other things, Swiss Chard. We’ve never cooked with Swiss Chard before. Soup sounded good so we threw in the swiss chard and some other vegetables we had on hand and called it dinner. What we love about soups is no matter what the recipe calls for, we throw it in if we have it. This means we almost always never follow a recipe. Soup is a good “clean up the fridge” kind of meal! Also, please note with this recipe that we do not cook with oil at home and only add salt to season with. Feel free to make adjustments as you see fit. Also, we use no salt added vegetable broth which has a nice, deep color. We also use liquid aminos in place of tamari or soy sauce but they are interchangeable to what you have on hand. 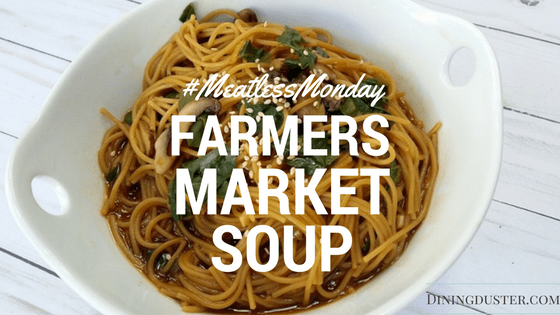 This meal is perfect for a #meatlessmonday meal or a delicious and hearty soup any day of the week! 1. Heat a non-stick pan, add a splash of vegetable broth. Use oil here if you prefer. Add the mushrooms and white part of the scallions. When softened, add garlic and ginger and cook, stirring occasionally, until softened. 2. Add the liquid amino, and let cook for 1 more minute, then add the broth, cover, and bring to a low boil. Turn the heat down to medium, and let simmer uncovered for 10 minutes. 4. Divide evenly into bowls for serving. Sprinkle with toasted sesame seeds. This recipe is lower in sodium and doesn't use oil. This is a personal choice. We use Liquid Aminos in place of soy sauce so that is what is used here. We also use no salt added vegetable broth to saute vegetables and a good, non-stick pan and can sautee without difficulty. If you wanted to use sesame oil to sautee the vegetables, that would add a nice layer of flavor. I love liquid aminos! 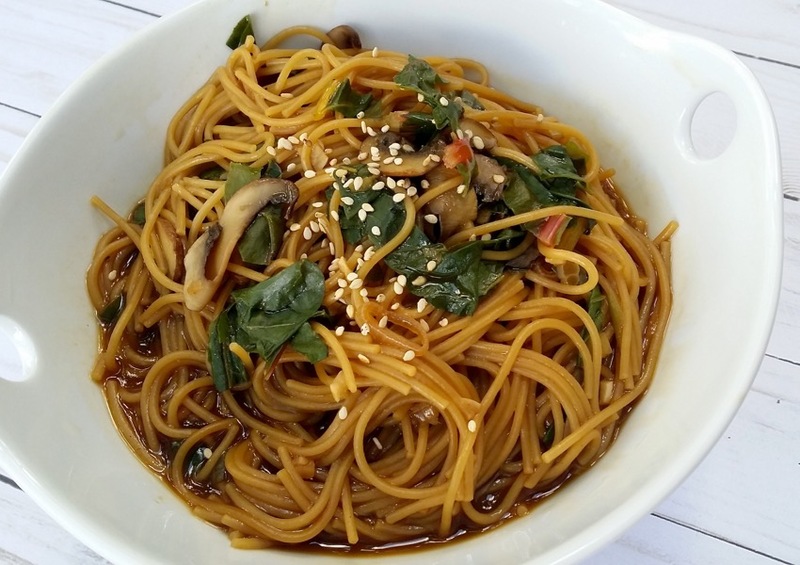 I’m guilty of using it and soy sauce though…This is a great recipe! LOL on using both aminos and soy sauce. There’s something about that salt though! Thank you! It tasted wonderful and the best part is how simple it is to make, and versatile!